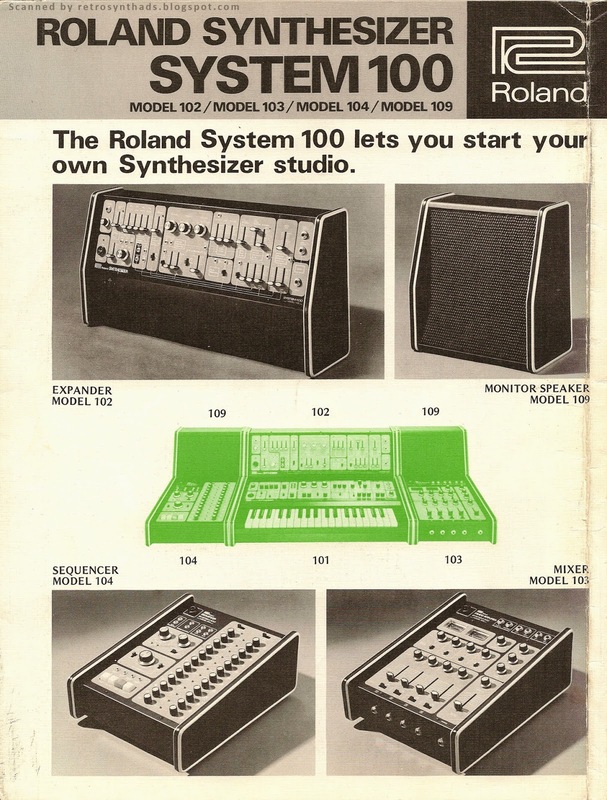 Roland Synthesizer System 100 Model 102/103/104/109 "Let's you start your own Synthesizer studio" six page brochure from January 1976. Sure. Call it hopping on the bandwagon. I don't mind. Remember - the best way to view the hi-res scans is to right-click and select "show image" or whatever the equivalent in your browser might be. 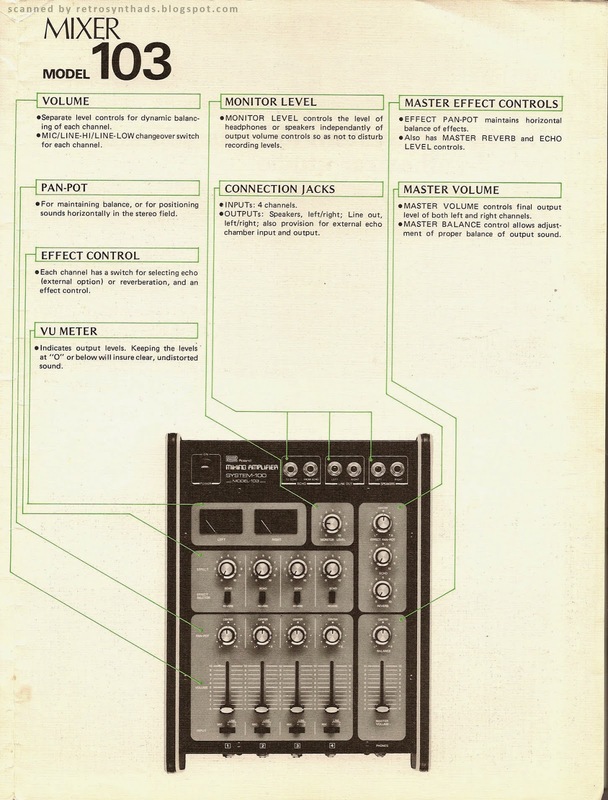 "The System 100 synthesizer is composed of separate component banks: the Model 104 sequencer; the Model 102 expander; the Model 103 mixer; two Model 109 monitor speakers, and the basic Model 101. 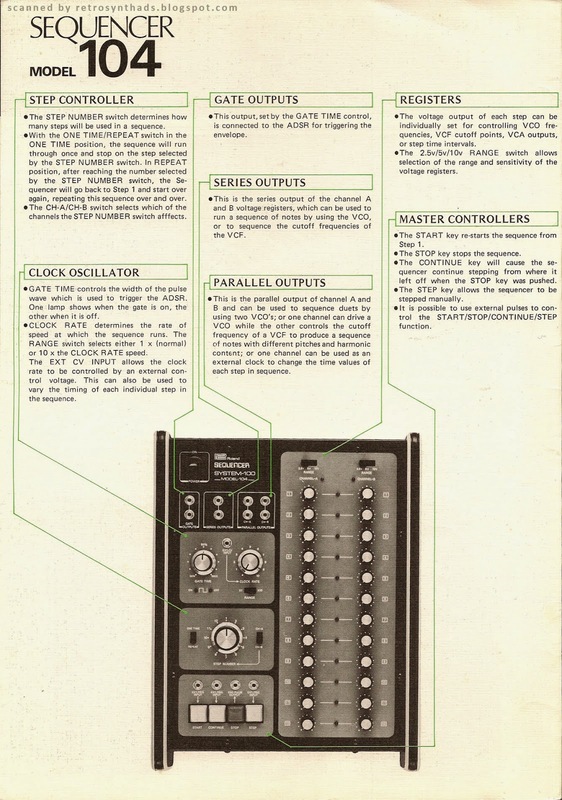 The basic unit itself includes a VCO, a VCF, an LFO, and an ADSR envelope generator. Other features are a noise generator, a high-pass filter, an audio mixer, and a test oscillator. A 37-note keyboard is standard. 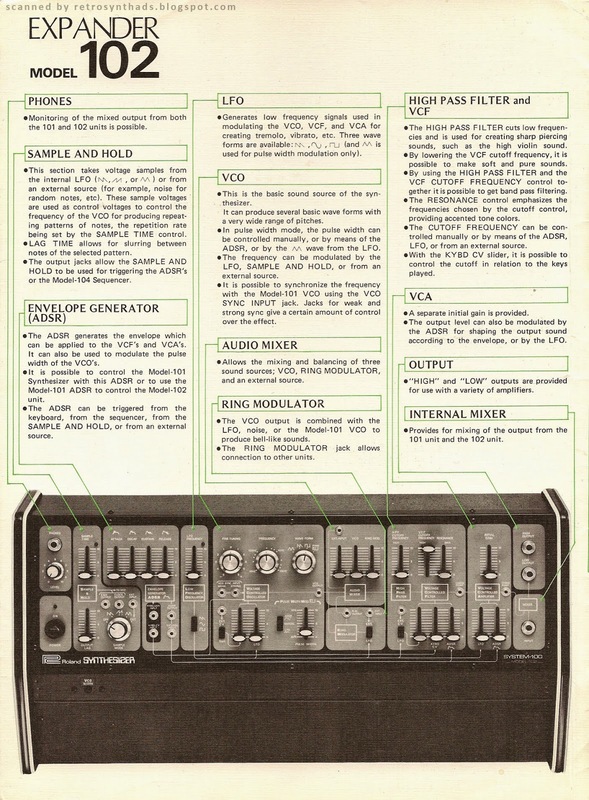 The Model 102 expander supplies the performer with a sample/hold circuit, an envelope generator, an LFO, and a VCA. The 104 module is a 2-channel, 12-step analog sequencer (both channels may be linked together for 24-step sequences). 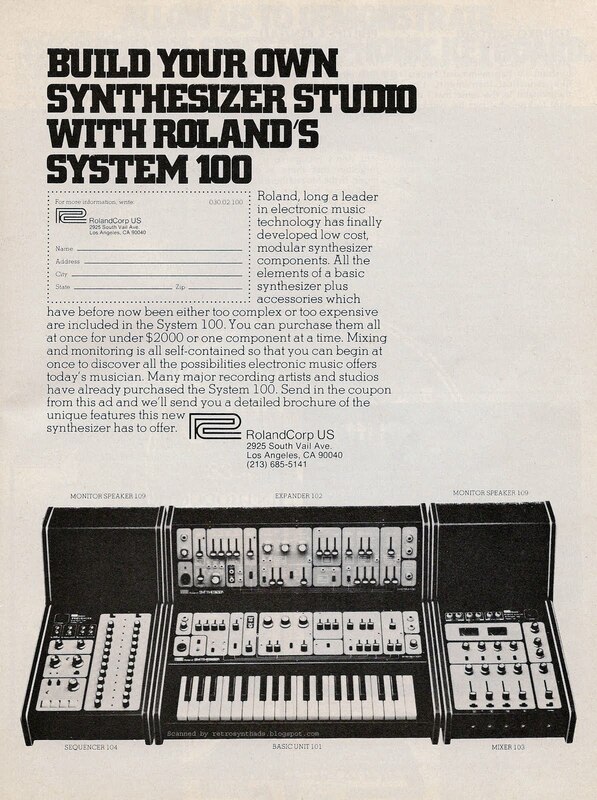 List price for the System 100 is $1,950. " List price $1,950. Not bad at all for everything you got. Until recently, the only time I had ever played on a System 100 was in a friend's basement a long, long time ago. He had the whole package. And it was a beauty. I remember being fascinated at both the look and the sound. 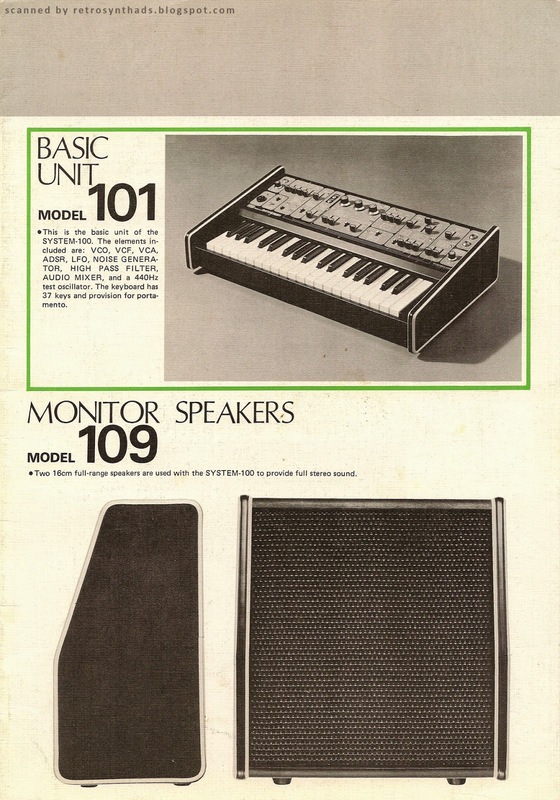 I say until recently, because just a few months ago I managed to find a System 100 Model 101 unit in my home town. You bet I jumped on the chance. It's in wonderful condition too.And the sound is exactly how I remember it. I've now started the long journey of tracking down the other pieces. Hi. Love your posts. 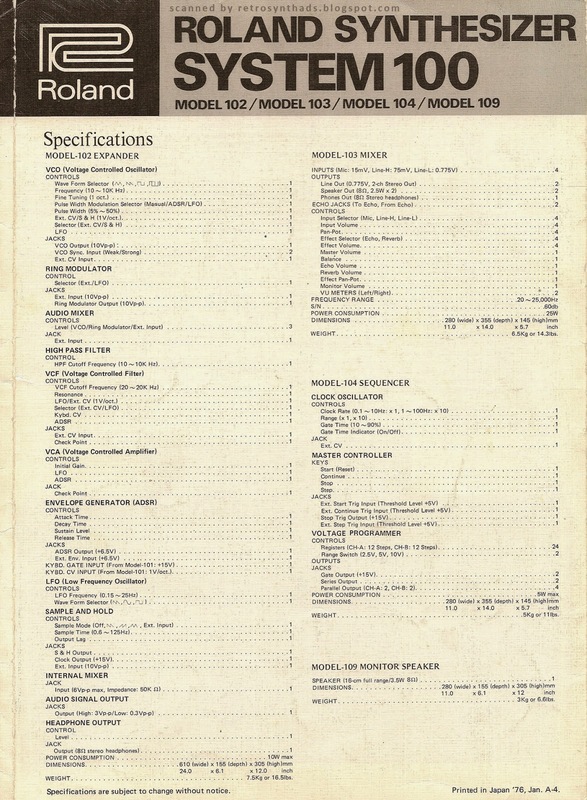 Do you have hi--res versions of the Jupiter 4 and RS-505 ads? I'd love to make posters out of them for my studio/home.